Eye Magazine | Feature | Godard: Images, Sounds, Politics. 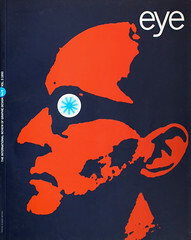 Richard Hollis’ design for Colin MacCabe’s book on the French filmmaker Jean-Luc Godard (Macmillan / British Film Institute, 1980) belongs to a small, visionary group of publications which, years before the advent of multimedia, suggested alternative approaches to traditional book formats. Like the Commentaires published by the French film director Chris Marker in the 1960s, the books of Marshall McLuhan and Quentin Fiore (see Eye no. 8 vol. 2) and Hollis’ earlier design for Ways Of Seeing (1972), Godard: Images, Sounds, Politics. uses images to amplify and substitute for verbal argument. The book was photoset in Times on a Compugraphic system chapter by chapter as it was written and these ‘rushes’ were pasted up by Hollis himself into a grid determined by the ratio of the film image. The text measure contracts to form a central gutter for film sequences at the point where they are discussed and notes are starred and inset for ease of reference. To further aid accessibility, film titles and quotations are highlighted in bold. The fluid, filmic quality of the book is carried through in the use of American Typewriter bold condense to suggest slightly blurred subtitles and in the placement of chapter headings in a screen-like panel.